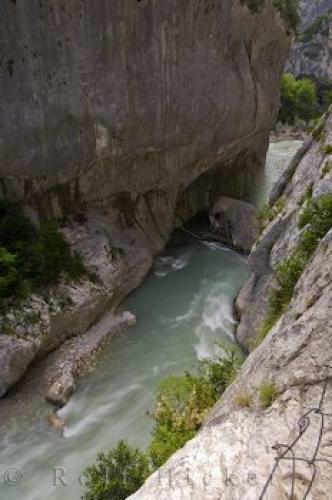 Looking down into a narrow gorge, just one stop along the fascinating Verdon river in Gorges du Verdon in the Alpes de Haute, Provence, France. Alpes de Haute in Provence, France in Europe. ... There are half a dozen hotels in the area for those who wish to spend some time exploring this exciting and beautiful Grand Canyon du Verdon in the Alpes de Haute in Provence, France. Verdon River in the Grand Canyon du Verdon, Gorges du Verdon, from Point Sublime, Parc Naturel Regional du Verdon, Alpes de Haute, Provence, France, Europe. I photographed this photo with the digital SLR camera model Canon EOS-1Ds Mark II, aperture of f/18.0, exposure time of 1/2 sec. on ISO 50, as always I used a original Canon Lens, the focus lenght for this picture was 23mm.